George W. Bush’s highly anticipated memoir Decision Points will be released on November 9th with a first printing of 1.5 million hardcovers. In addition, two ebook versions of Decision Points will also be available—a standard ebook and a deluxe version that includes interactive links to videos, photos, and full text speeches. According the book’s website, the deluxe ebook features video of his speeches, home movies, full texts of his most important speeches, handwritten letters, and more than 50 photos not contained in the print version. 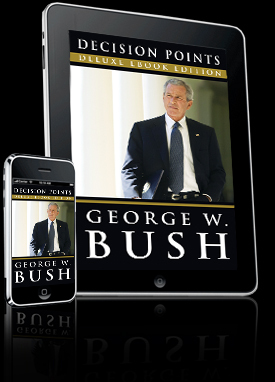 The deluxe ebook is available via the Kindle app for iPhone, iPad, and iPod Touch. It’s worth noting that Amazon currently has both ebook editions priced at $9.99. Decision Points will be released in hardcover, audiobook (Abridged), ebook, and deluxe ebook versions on November 9th. President George W. Bush describes the critical decisions of his presidency and personal life. Decision Points is the extraordinary memoir of America’s 43rd president. Shattering the conventions of political autobiography, George W. Bush offers a strikingly candid journey through the defining decisions of his life. In gripping, never-before-heard detail, President Bush brings readers inside the Texas Governor’s Mansion on the night of the hotly contested 2000 election; aboard Air Force One on 9/11, in the hours after America’s most devastating attack since Pearl Harbor; at the head of the table in the Situation Room in the moments before launching the war in Iraq; and behind the Oval Office desk for his historic and controversial decisions on the financial crisis, Hurricane Katrina, Afghanistan, Iran, and other issues that have shaped the first decade of the 21st century.